Excel: ​Are you an analyst? Use these 25 shortcuts & tricks to boost your productivity - Something New Everyday! Analyst's life is busy. 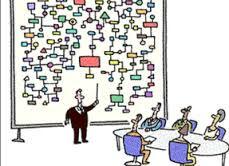 We have to gather data, clean it up, analyze it, dig the stories buried in it, present them, convince our bosses about the truth, gather more evidence, run tests, simulations or scenarios, share more insights, grab a cup of coffee and start all over again with a different problem. Writing formulas is a big part of analyst life. Use below tricks to reduce the time you spend writing Excel formulas. Debug portions of the formula with F9 key: When working with long formulas, often we come across situations when the result doesn't make any sense. You can debug portions of such long formulas using F9 key. Just select the formula portion and press F9 to see the corresponding result. Pivot tables are a big part of analyst's life. Use below tricks to work faster with Pivot tables. Double click any value to drill down: When looking at pivot tables, if you want to know which records correspond to a particular total, just double click on the number. This will show a new sheet with only data for that number. Sort quickly with right click: Sort your pivot reports by simply right clicking on the value field and choosing sort option. A good analyst must create user friendly workbooks because a great deal of the job involves communicating with users. This is where ideas like data validation, form controls & slicers come handy. Here are few hacks to deal with such things faster. A good chart may get you that hike. So it's no wonder we, analysts spend a lot of time working on charts. Use arrow keys to select individual chart elements: When working with charts, we have to select a chart element (bars, columns, titles, axes, legend etc.) before doing anything to it. To quickly select a chart element, simply activate the chart and use arrow keys. Adjust chart's source data with drag and drop: If you want to change a chart's source data, simply use drag and drop. Select the chart series (for ex: in a line chart, select the line you want to change). This will highlight the source data range. Now using mouse pointer simply drag and drop the highlighted box to wherever you want. Done! Use the select objects tool: When working with multiple charts, often you may want to adjust settings for all in one go. Wouldn't it be great if you can draw a box containing all charts and everything gets selected, a la Power Point (or image editing software)? Well, you can do that in Excel too. 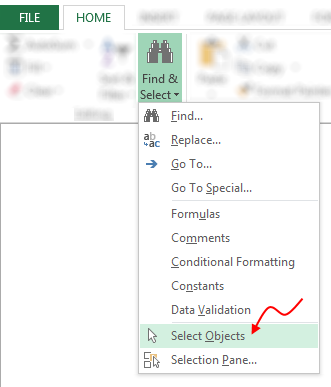 Simply activate select objects tool from Home > Find & Select > Select Objects. In fact, I suggest adding this tool to quick access toolbar (right click on the select objects tool and choose Add to quick access toolbar) so that you can fire it up whenever you want. It's no good if you are productive. Your presentation skills are equally (if not more) important. Let's see some powerful formatting / presentation tricks. If your report has multiple charts (or shapes), then align them all, you must. Having perfect alignment doesn't mean you waste several minutes nudging each chart in to right position. Simple select them all (using the select objects tool, of course) and fire up alignment tools from either Page Layout or Format ribbon. Align and space objects in a consistent way. Repeat last actions with F4 key: Let's say you are changing font color for various chart elements. You can do this step once on something like vertical axis, then select other items and simply press F4. This will repeat your last action (ie font change) on the new selection. Format once, paint many times: Use format painter tool from Home ribbon to quickly apply format settings (including conditional formats) from one range to many. Works awesomely and saves you several precious minutes of formatting time.